Don Henley, James Taylor, Ringo Starr, Chris Stapleton and Haim will perform alongside Joe Walsh to raise money for veterans organizations — a cause Walsh has been connected to since childhood. 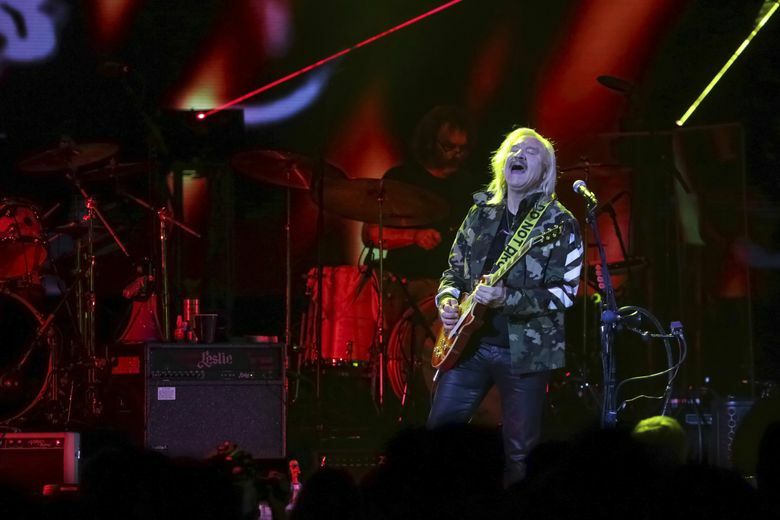 Joe Walsh still remembers the loneliness. The Rock & Roll Hall of Famer was only 20 months old when his father, who served in the U.S. Army Air Forces, died while on active duty in Japan. Veterans issues have been near and dear to the legendary guitarist’s heart for a long time, but recently he decided to do something big. Last year Walsh launched his philanthropic organization VetsAid, anchored around an annual fundraising concert and modeled after Willie Nelson’s long-running Farm Aid shows. After an inaugural Virginia concert in 2017 that raised more than $400,000 for veterans nonprofits, Walsh is bringing his star-powered benefit show to the West Coast on Veterans Day. The second annual event goes down this Sunday, Nov. 11, at the Tacoma Dome, with performances from classic rock greats Walsh and his Eagles mate Don Henley, James Taylor and country star Chris Stapleton. Soft-rock sister trio Haim joins the lineup, injecting a little youth. After the show was announced, another one of Walsh’s longtime pals, Ringo Starr (their wives are sisters), was added as a special guest. Why Tacoma? Walsh knew he wanted his charitable bash to hit different regions each year and the South Sound city — with an arena more than twice the size of last year’s venue in Virginia and proximity to Joint Base Lewis-McChord — gave them “the best shot we got at doing some good,” Walsh says. This year’s event also features a job fair for vets before the show at Tacoma’s Goodwill Milgard Opportunity Center. While in town, Walsh plans to visit the base to meet with local servicemen and women. Initially, many of the guys didn’t know, or care, that Walsh was a rock ‘n’ roll icon. But as he chatted them up, one of the vets handed Walsh an out-of-tune guitar and asked Walsh to teach him “Hotel California.” Recognizing the Eagles’ biggest hit, others gathered around sparking an impromptu guitar seminar. With a number of his more famous “buds” under one domed roof Sunday, there’s a good chance we’ll get a few impromptu collaborations during the show. “Of course, if Don’s gonna do ‘Hotel California,’ ‘[Life in the] Fast Lane,’ I should probably go out if I’m in the house,” Walsh says. Both Stapleton and Taylor joined the Eagles this year on select dates of the band’s first major tour following Glenn Frey’s death, and Walsh says he expects to do “Steamroller Blues” with Taylor. Any other joint performances are TBD, Walsh says, save for a possible group rendition of the Beatles’ “With a Little Help From My Friends” to cap the night. With roughly 80 percent of the tickets sold (as of two weeks ago), according to Walsh, it’s not yet clear how much VetsAid will raise this year. Walsh jokes that he had no idea how much work it’d take to throw a benefit concert, but he’s grateful for the generosity from the artists and behind-the-scenes players.